Your husband is turning 50 and you need to come up with a party idea for the big day. Relax! There are plenty of 50th birthday party ideas. Your goal should be to make it fun and memorable; and try to embarrass him a little, too. A party reminiscent of his teens, a trivia-themed party and a roast are just a few ideas you can toy with. Having a party that takes you and your husband back to your teen years can be a blast. Invite plenty of old high school friends. When you send out the invitations, make sure you tell everyone to wear old varsity sweaters or clothing like they wore in high school. You can blow up pictures of your husband from his yearbook. Include pictures of your guests in action as youths, as well. 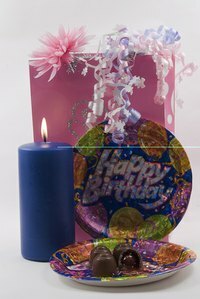 Decorate your party surroundings with a combination of "50th Birthday" and decade-related items. For example, if he graduated in the 70s, put up some strobe lights. Make sure you garner a large collection of your favorite tunes from your high school days, as well. Another idea for your husband's 50th birthday party is to select some items that are important to him. For example, if he was the star quarterback, find a football. If your husband liked collecting "Star Wars" memorabilia, place Darth Vader on the table. The key is to find a few different items that are important to your husband. Divide your guests into separate teams, or simply assign each table as a team, if you have rented out a hall. Have each table create a story about one or two of the items. Allow guests to make up funny stories if they want, or tell a true funny story about your husband in reference to the item. At the end, each table can tell the birthday boy how much he means to them. Have a trivia-themed party. You can pull out some old photos of your husband from different years. You might also include at least one with the two of you together. Purchase about 10 colorful poster boards. Blow the pictures up, then include a trivia question on each poster board. Include a question related to when the two of you met, how many brothers and sisters he has, or even the name of a favorite pet in high school. Create a quiz with all of the questions, then have your guests answer the questions. Have a small gift for the winner. You can also have a roast for your husband, according to Celebrations.com. Rent out a hall and make him the guest of honor. Place him at the center of the table. Let some of the guests walk up and roast your husband. Make sure you invite a combination of family, relatives and friends. Include lots of "Happy 50th" balloons, signs and streamers.